Not since the printing press has a media object been as celebrated for its role in the advancement of knowledge as the scientific journal. 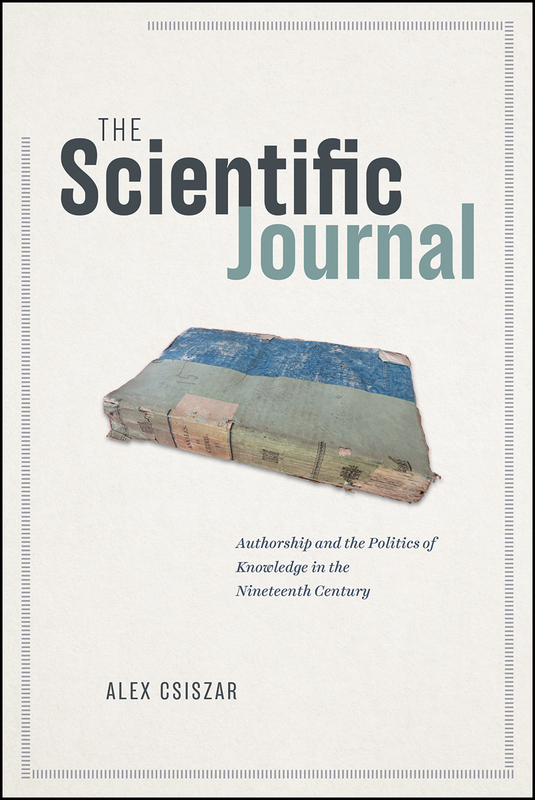 From open communication to peer review, the scientific journal has long been central both to the identity of academic scientists and to the public legitimacy of scientific knowledge. But that was not always the case. At the dawn of the nineteenth century, academies and societies dominated elite study of the natural world. Journals were a relatively marginal feature of this world, and sometimes even an object of outright suspicion. The Scientific Journal tells the story of how that changed. Alex Csiszar takes readers deep into nineteenth-century London and Paris, where savants struggled to reshape scientific life in the light of rapidly changing political mores and the growing importance of the press in public life. The scientific journal did not arise as a natural solution to the problem of communicating scientific discoveries. Rather, as Csiszar shows, its dominance was a hard-won compromise born of political exigencies, shifting epistemic values, intellectual property debates, and the demands of commerce. Many of the tensions and problems that plague scholarly publishing today are rooted in these tangled beginnings. As we seek to make sense of our own moment of intense experimentation in publishing platforms, peer review, and information curation, Csiszar argues powerfully that a better understanding of the journal’s past will be crucial to imagining future forms for the expression and organization of knowledge. 5 What Is a Scientific Paper? "[F]ascinating and carefully researched . . . . This timely book challenges our notion of the traditional scientific journal by showing that it was the result of a long and complex historical process and much controversy." "A timely reminder that the literary marketplace and political ideologies, together with science practitioners' own interests, shape the vehicles and multiple roles of science communication. . . . It is indispensable for graduates in the history of science and, especially, in library and information science. . . . Essential." "This clever and absorbing history charts the coming into being and imminent passing away of one of the most important forms of scientific activity - journal publication. Stocked with fascinating tales of scientific authors' deeds and sufferings, and of publishers' market savvy and ingenious trickery, Csiszar shows that the allegedly novel and dramatic alliance between scientific writing and commercial interest is nothing new, and in fact dominated the original developments of scientific literature and its vagaries in earlier centuries. The book explains how the notion of a quick and cheap technological fix for any apparent trouble of public knowledge first gained ground and why its mythology so evidently survives. The book will be indispensable for anyone interested in the roots of trust in scientific facts and their authors, and the central role played by print media in the crisis of intellectual authority." "The book is full of detailed sketches of the fascinating personalities involved in the development of an institution -- journal publishing -- that we often think of as having always existed. Csiszar gives a compelling account of how the publication of scientific results in the fragmented form of journal articles won out as a format over comprehensive books. . . . This book will be a very welcome resource for students of the history of academic publishing, as well as anyone with an interest in the history of science as it tracks with the origins of the institution of the scientific journal."